Route 66, a journey: Got wheels? Most people never buy a set of wheels separate from a bike. Most people have never ridden on a wheel that's seriously compromised. But if you've ever had a flat tire (a punctured tube), you know how important it is for the wheel to be in good shape. Progress just stops. If you've ever broken a spoke (like the guy in front of me last year on a long event), you know that fragile feeling of limping to wherever help is available. And wheel failure on a tour, with a dented rim or multiple broken spokes or a busted hub? Either there's a wheelbuilder with a shop nearby, or you're hitchhiking. On a bike you can get out there in the middle of nowhere, very far from any mechanical help. PAC Tour will carry some supplies in their van, but anything more serious than a broken spoke might be a deal breaker on Route 66. According to Gary Kern, Albuquerque is the only town with bike shops. Over 1100 miles, one town. That's what we need to prepare for. 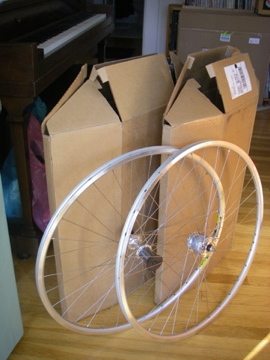 When you order a set of wheels you'll specify a lot of details (too many). How many spokes, front and rear? What kind of rim? What kind of spokes? What brand of hub? How much do you weigh? What is the maximum weight you'll ever carry on these wheels? Your thoughts will spin like the wheels that don't yet exist! You'll summon the mental image of being stranded in the middle of the Mojave Desert when you write the big check. Someone in a workshop will build them, usually by hand (spoke by spoke). And then the funny-shaped boxes will arrive. Mine came from this shop in New Hampshire. They're relatively lightweight touring wheels, with 32 spokes front and rear. More spokes is a good choice for rough pavement and dirt. We'll encounter plenty of both on the old roads. The wheels that came with the Waterford are lighter, faster, more aerodynamic; these are slower but more durable. Tried and true. 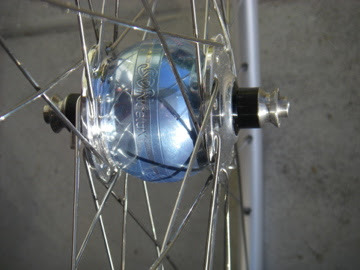 Also, the front hub generates electricity, for chasing coyotes! For more cheap fun, try reading this rant from the wheelbuilder. If it doesn't make you roll on the floor laughing, at least you can tell from the number of words that wheels are important.